Leslie Basham: Bill and Holly Elliff are parents of eight children, but they didn't always plan on having such a big family. Here's Holly Elliff. Holly Elliff: We did marry in college in the early 70's. We immediately started using birth control. I don't remember us praying through whether we wanted to do that or—it was just kind of the normal thing to do. Leslie: This is Revive Our Hearts with Nancy Leigh DeMoss. It's Monday, July 7. You probably pray and seek God's wisdom on many issues, but have you sought God's will regarding the size of your family? Today we'll hear from a woman who did seek God's direction in this area through prayer and the Bible. Here's Nancy to introduce today's guest. Nancy Leigh DeMoss: Over the next few days, I want you to get to know a very special friend of mine. Holly Elliff and I have known each other since the early 80's, and she has been one of those very wise and godly women influences in my life. Holly, welcome to Revive Our Hearts. Nancy: Holly is a pastor's wife. Her husband, Bill, is a pastor in the Little Rock area, and they are the parents of eight children. Yes, you got that right, and actually, that's at the heart of some of what we want to talk about over these next few days. this is a matter that has been a topic of great controversy and one that I think is so important for women to address because it goes to the heart of a part of our role and our calling as women. We want to talk about this whole matter of childbearing and what is God's purpose? What is God's plan? What does His Word, most importantly, have to say about this major area of a woman's life? Holly, take us back to the days before there were little Elliffs and when you and Bill first married, even when you were dating, perhaps. Had you thought about how many children you wanted to have? Did you always intend to have a large family? Where were you and Bill on that matter? Holly: Well, actually, Billy and I have known each other since junior high school. In high school, when we thought we might get married someday, we used to make lists of names of our children. Nancy: How many names were on that list? Holly: Oh, three or four probably. We did marry in college, in the early 70's, and at that point, immediately started using birth control. I don't remember us praying through whether we wanted to do that or—honestly, it was just kind of the normal thing to do. I had a degree in speech pathology, and Billy was headed for seminary. We had negative ten dollars a month in our budget when we got married, and so for four years I taught, and Billy went to seminary. At the end of that time, we decided we were ready to start a family. So after four years of marriage, our first daughter was born—Jennifer. For the next several years, we continued to use birth control and stopped whenever we felt like we were ready to have another child. We had always wanted four children. That was kind of the number that was in our head, and so, not until I was pregnant with the fourth child, did this really become an issue in our life. Nancy: And when you say it became an issue, why did it become an issue? What kept you from just saying four—that's the number, and that's where we'll stop? Holly: Well, at that point, we were living in Oklahoma. We were exposed to some larger, godly families. Nancy: And by larger . . . ? Holly: By larger, I mean five, six, seven, eight. Nancy: That seemed like a lot to you. Holly: Actually, I had grown up as the oldest of four, and I didn't really want to have to work as hard as I saw my mother work. I was not at all looking to have a large family. My goal in life, as a young woman, was to become a clinical speech pathologist and drive a little, red, sports car. That's what I wanted to do with my life. Well, needless to say, God, over the course of those early years, changed those things as the goal for my life. As we were confronted with some of these larger, godly families, suddenly, it became very strange to us that we had a number of children that we thought we were supposed to have and had no idea where that number came from. At that point, we really began to question, what does the Bible say about this? Why are these other families choosing to have more children? I thought it was a very radical thing for them to be doing that, and it did make me very afraid. Nancy: Afraid of—what were your worst nightmares as you thought about . . . ? Holly: My worst nightmares were wearing maternity clothes for the rest of my life and weighing 400 pounds. I really had a vision of mothers of large families that was not very flattering, and personally, I did not want to be one. What happened was that we began to be troubled about this. Eventually, we went to the parents of one of these large families that we knew were a godly couple. We knew they sought the Lord in the decisions they made. We went to them and asked them why they had such a large family. I think they had seven or eight children at that point. What they did was really challenge us to do what someone had challenged them to do, which was to pick up our Bibles, become like Berean Christians . . .
Nancy: And Berean Christians were those who didn't just accept the apostles' teaching. They went back to the Scripture and checked it out for themselves to make sure that what the apostles were saying was really consistent with the Word of God. Nancy: So you were being challenged to take your viewpoint and put it up against the grid of the Word. Holly: Really, we didn't even know what our viewpoint was at that point. I don't remember anyone ever challenging us to think that through, to put it up against the standard of God's Word. It was the norm for that day, and that's what we did. Here we were being challenged for the first time to really examine that in light of God's Word. Nancy: So you're a pastor's wife. You already have now four children, or the fourth on the way. I assume there's some question about income here, perhaps living on somewhat of a limited income. That had to be a factor in your thinking. As you went to the Word, were there some hesitations or reservations that you found affecting your thinking as you began to study God's thinking on this? What does God say about the whole area of children? What about the whole issue of God's sovereignty in that area (which had never occurred to me). I had never wondered, "Is there any sense in which I might be violating God's sovereignty in controlling the size of my family?" that it was a good thing. I remember vividly the day he came out of his study. He had this wonderful vision of what it would be like of someday sitting on my front porch and looking out and seeing scores of children out there. We would have every temperament type represented. We would have every spiritual gift represented, and our children would know how to relate to everybody in the world because they live with all different types of people. I immediately said to him, “Well, that's very easy for you to say because I'm the one wearing the stretch pants for the next 20 years, and I'm sorry, but I just don't want to go there.” I really did not want to go there. It was a very frightening thing to me to think of taking my hands off that control in my life. It took me about six months to work through what I believed the Bible said about that whole issue, and I became an avid student of God's Word and just began to search the Scriptures for every reference to children, to children as a blessing, to God's sovereignty in that area as far as opening and closing the womb and looking, honestly, for a way to avoid releasing that area in my life because my preference at that point was not to relinquish that area to the Lord. that it was all His business. I remember vividly one night sitting down at my kitchen table with a legal pad and a sharp pencil and making a list. 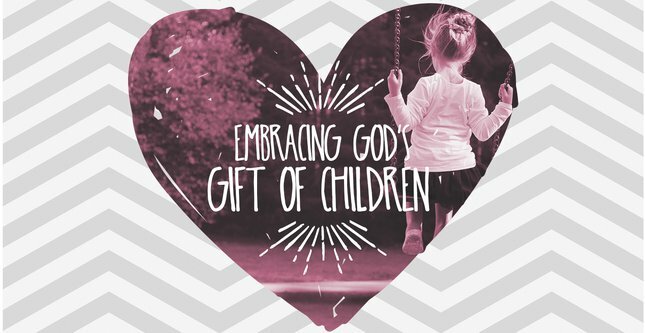 At the top of the list, I wrote, “reasons I don't want to have a million children,” and I began to make a list of all the objections I had to what I was seeing in God's Word. Nancy: And tell us, what were some of the things you wrote on that list? Fears about what it would do to my physical body. A fear of being pregnant every nine months for the rest of my adult life. Financial fears—if we have these children, can we support them? Can we love a larger number of children? Is that possible? Fears related to what other people would think. I got to the bottom of that list, and I laid down my pencil. I read back through that list, and a sudden sense of the total selfishness of everything I had put on that list swept over me. I looked at it, and I thought, “I cannot believe that's what's in my heart.” Everything I had on the list was rooted in selfishness. Holly: Well, the bottom line was, it came down to whether or not I was better at making decisions than God was. Was I going to be better at determining what my financial state ought to be than the Lord? Was I going to be better at determining the number of children I could love than God Himself? It suddenly became very clear to me that this was a heart issue, at least in my life. It was a surrender issue. It was a matter of me choosing, just like I said God was Lord in every other aspect of my life. Nancy: As God began to turn your heart on this, and you saw it as a surrender issue, were you just quickly then able to say, “Okay, Lord, however many children You want us to have, I'll just throw away this list of objections and . . .
Holly: Well, that night was a real turning point as I really saw the groundwork of my heart a little bit and the selfishness that was there because, even though my husband had quickly come to that decision, I was the one that I thought was going to be pregnant every nine months. It was very difficult for me to release control of that area. Nancy: Did you do that that night? Holly: That night, I really did see it suddenly as an issue of surrender, and I did surrender to the Lord in that area, not knowing what that meant. I really thought at that point, “Lord, I'm going to have 25 children.” It scared me to death, and even as I surrendered to it, it was a very frightening thing. He said, “That's fine. It will probably take you six months to get pregnant.” Well, I got pregnant two weeks later, as soon as we quit using birth control, and that continued to happen. Every time we decided we were ready for a child, stopped using birth control, I was always pregnant the same month. Nancy: So you figured you'd be pregnant all the time. Holly: So the thought of never again using birth control, relinquishing that area to the Lord, to me, honestly meant, I will be pregnant every nine months. Nancy: That turned out not to be the case for you, right? Holly: That's exactly right, and actually, our two closest children occurred while we were using birth control and thought we were in control of that. Since that time, our children have not been any closer than that. Our closest ones are 18 months apart, and it was astounding to me that my husband and I could just live as a husband and wife and that I did not get pregnant. It blew me away to realize that God really was controlling an area of my life that I thought for years I had been in control of. Nancy: So as you came to the point of releasing this area of your life to the Lord, practically, how did that affect decisions that you and your husband began to make then after the birth of that fourth child? Holly: Well, really, the next time that we dealt heavily with this was after our fourth one was born, and we had to make the decision after that pregnancy, will we pick up birth control again? Have we laid it down forever, and so really, after Joshua was born, we did go before the Lord, say, “Lord, is this an area of our life that You want total control of? After months of searching God's Word, trying to find a reason why we would not do this, we really became convinced that God was saying to us through His Word, biblically, that we were to totally release that area of our life to Him. It was still frightening to me, but at that point, that is the decision that we made. After the birth of our fourth child, we simply just lived. Since then, God has given us four more children. I've actually been pregnant six more times, and I can honestly say looking back, I have absolutely not one regret about that choice. Nancy: What happened when you began to share with others—your parents, friends? Did they think you had lost your mind when you told them the conclusion you'd come to? Holly: Well, you know, Billy and I really did not think of ourselves as radicals. We were pretty traditional people. God just simply took us to the place where this became an issue in our life. As we relinquished control of that area, we did receive some interesting reactions. I remember vividly telling my mother that I was pregnant with my fifth child, and she cried. Now, somewhere between number five and number eight, actually ten pregnancies total—somewhere in there, she just decided we were kind of crazy anyway, and she was not going to worry about it anymore. She actually said to me one time, “If you really want to shorten your life by doing this, I certainly am not going to stop you,” and initially, that was her concern. Choosing to have many children or to allow God to give you whatever children He desires you to have is not necessarily something you want to do if you want to be free, if you want to have lots of naps in the afternoon, if you want to have an agenda that is simple. Having a houseful of children is not simple, and it is not easy. Holly: Well, I'll tell you what I have found, and it's really been an amazing thing. Somewhere in there, about my fourth, fifth child, saying to the Lord one night, “God, I really don't know that I can do this. This is so hard. I am so tired. I never accomplish enough. No matter what I do all day, nothing is ever finished.” I was so frustrated. Nancy: Have you found that that's been true? Holly: I have found that that has been true—not perhaps the platform I would have chosen for myself at twenty because my goals were so different. But what I have found is that now, the life message that I have has been worked into my life through the reality of living that message. I really did not need as much time for myself as I thought. I could learn to have a quiet heart even in the midst of chaos. I could hear from God while I was sorting laundry or picking up children's toys or school books late at night. The quiet moments became very valuable to me, and even sitting up late at night nursing a baby or rocking a child who'd had a nightmare, those times became very precious times when God's Spirit just really ministered to me, not because I had time to go spend hours in Bible study, but because I was, I believe, in the center of His will accomplishing part of what He had called me to do. More and more my children became a tool that revealed what was in my heart, that revealed the need in my own life, that there is always a need for God to work His life out through me as He lives out His Spirit in me. I like the way you made that so practical because you said, “We went to the Lord and said, 'Lord, what do You want us to do in this area of our lives? '” You had asked God that question about other areas of your life, but now in this area, there was a new sense of release and relinquishment to the will of God. The fact is, you and I are not totally free until we have released ourselves, our lives, our future, our marital status, our childbearing—every aspect of our lives—fully to the control of Jesus Christ. Leslie: That's Nancy Leigh DeMoss talking with Holly Elliff about trusting God in every area of life. Do you have thoughts about today's program? You can post yours and read what others have to say. Just visit our listener blog at ReviveOurHearts.com. Click on the title of today's program. It's called, "A Full Quiver." You'll see the listener blog located below today's transcript. I'm so thankful for those transcripts, and one reason is because you can read from years' worth of programs. That means when you're facing a particular issue, you can hear Nancy's biblical teaching on it, no matter what series we're currently airing. Well, I want to offer thanks to listeners who help us provide biblical counsel on womanhood and marriage. The listeners who donate to Revive Our Hearts make this kind of life-transformation possible. From the inception of Revive Our Hearts, we've needed listeners to catch a vision for this program and allow us to continue through their support. If you like what we're doing, we need to hear from you. Would you make a donation at ReviveOurHearts.com or call us at 1-800-569-5959? Well, tomorrow, Holly Elliff will recount some of the challenges she's had as a mother of eight and tell us how God has given her strength. We hope you can be here for Revive Our Hearts.